Mr Bill Phippen, TAD President of 15 years, has been awarded an Order of Australia Medal in the 2013 Australia Day Honours. Bill, a qualified engineer, has dedicated over 35 years of his life as a volunteer, designing and building custom equipment for people with disabilities. He is the President and a founding member of TAD Disability Services, the only charity in NSW which designs and builds custom equipment to enable people with disabilities to lead more independent lives. TAD’s core workforce comprises of nearly 300 skilled volunteers who are supported by a small staff team. 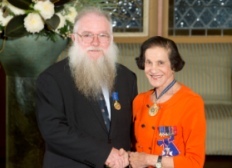 Bill joins a list of 10 other TAD volunteers in NSW to be given this honour, a huge achievement for a small organisation working hard to improve the lives of people with disabilities. Bill has made and modified cots to enable new mums with disabilities to look after their babies and has been an integral part of the Freedom Wheels modified bike program helping children with disabilities to ride a bike. “OAM for service to people with disability is overwhelming to me. I am thrilled that this award has come for routine work; meetings, drilling, cutting, sawing and painting to produce devices to benefit our friends with disability,” said Bill.